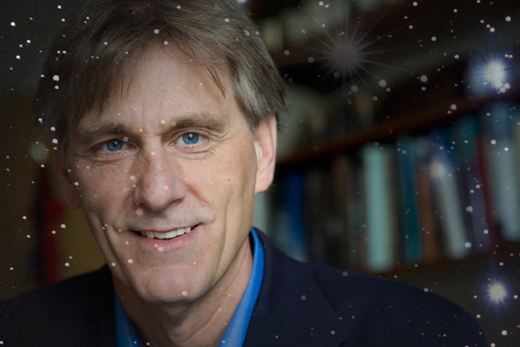 If life is an inherent property of matter — not something that arose on earth due to exceptional circumstances — than life is likely abundant across the universe, explains David Lynn, Asa Griggs Candler Professor of Chemistry and Biology. Ever look up at the stars and wonder: "Are we alone?" These days you also might look around Emory for an answer, beginning with how the Computational and Life Sciences (CLS) strategic initiative may be redefining life. "Ultimately what we're asking is whether life is an inherent property of matter," says David Lynn, Asa Griggs Candler Professor of Chemistry and Biology. Lynn's statement sounds simple, but its implications are huge. Did life arise on earth from exceptional circumstances? Or does life ordinarily emerge from matter? If the latter, life is likely abundant in the universe. Moreover, alternative forms of life might not just be discovered in outer space but also here on earth. By alternative forms of life, we mean not just the DNA-RNA complex common to protozoans and humans, but life biochemically structured in different ways. After all, if life emerges naturally from matter, why should it have developed so singularly in the DNA-RNA form that is so visible here on earth? Could "shadow bio-systems" also exist here on earth? Possibly so, explains Lynn. Perhaps they'll be discovered in remote subterranean areas or at the bottom of the oceans, though conceivably also all around us, given that significant portions of the biosphere remain relatively unmapped. Moreover, tantalizing evidence for the emergence of life may exist under our very noses -- or, rather, behind them. Amyloid formations in the brain, a source of Alzheimer's disease, may illustrate the self-assembly of pre-biotic structures necessary as a condition for life.